Oakbrooke Crossing community is sold out and is not in active development by builder. If you are interested in Oakbrooke Crossing or similar new home communities, contact us today! Our agents are very familiar with new and newer construction in Chesapeake, and can identify resale opportunities in Oakbrooke Crossing, as well as builder inventory available in nearby or similar communities in Chesapeake. To view 8 more pictures, interactive maps and the full, detailed description of the Oakbrooke Crossing community, please Login. At Oakbrooke Crossing, a new construction condo can be the golden ticket to living the high life. The builders here knew exactly what they were doing when they designed these low-maintenance homes with upscale features. Centrally located in the Greenbrier section of Chesapeake, VA, this development allows residents the convenience of getting to military bases like past Coast Guard Base Portsmouth, Naval Medical Center Portsmouth and Norfolk Naval Shipyard. Welcome to the new construction homes in Oakbrooke Crossing. The builders have attended to all the little details that make coming home here a real treat. Each condo is around 1,300 square feet and features two master suites, kitchen pantry, brick exterior, storage shed, satin nickel door hardware, 42-inch kitchen cabinetry, stainless steel appliances, garbage disposal, natural gas heating and much more. Get away from the stresses of everyday life in this new construction development. Swim laps in the pool to stay strong and fit. Organize a neighborhood get together in the cabana. Condo owners also get the peace of mind knowing these amenities, along with the manicured grounds, are professionally maintained. Trash pickup is another perk for residents of Oakbrooke Crossing. Hampton Roads is a diverse area of Virginia and Chesapeake is no different. Families, singles and retirees from all different backgrounds like this city for a variety of reasons. Builders continue building shopping centers and new home communities to accommodate the growing population. Residents can enjoy golfing at the Chesapeake Golf Club and going to nearby Chesapeake City Park and Oak Grove Lake Park. To buy a new construction home in this complex is to begin a life filled with less hassles and more fun. Freeing up time in that schedule to do important things in life can pay off in the long run. Builders made every effort to build a condo development that causes less worries; Oakbrooke Crossing is just that place. 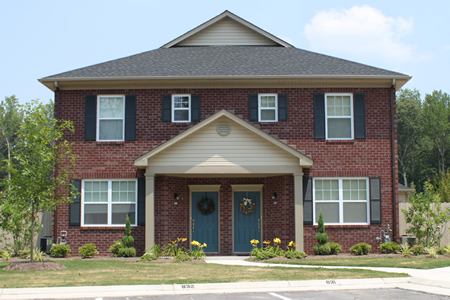 Send me more information about communities similar to Oakbrooke Crossing. Our agents gladly offer FREE property tours of Oakbrooke Crossing, Chesapeake and homebuyer consultations to all serious buyers.